I am struggling to find a file cabinet (drawer style) that will hold my 12 x 12 card stock. Any suggestions on where to find one ? Stacking Paper Caddy. Comes in two sizes. TeeGeeDee and bzzzeee like this post. The Container Store has a legal size cart that will hold 12 x 12 paper. Back when I started scrapping that was the only thing I could find. No one thought to create holders for it. Coordinating or identical papers plus good sized scraps are placed in these page protectors (within the white hanging file folders). The edge with holes can be trimmed off. The unit slides under my trimmer table so doesn�t take up real estate, but it�s something to consider. Last edited by bjeans; 08-29-2018 at 07:37 AM..
Good catch on the lower price for the Advantus file cart. And thanks for the link to the page protectors. I never thought to look for 12x12. I have struggled to find this too. I have the Recollection�s file paper cubes. They fit the 12 by 12 paper, and they have file folders for it. But, unfortunately, it is very unsteady. Nice paper tabbed filed links above. I bought one 10 years ago, it’s a rolling file cabinet it is very sturdy on the side plus I have a shelf on the base, we did not install the base shelf. I took a legal size file folders cut them and extended them with manila file folders using packing tape. So the file folders hang lower than what that base shelf would’ve been. It also has A bottom shelf which I was able to store extra 8.5 by 11 card stock. I am not home otherwise would take you a picture. All that being said, with me accumulating so much stuff I am finding that the file folders take a lot of space especially when you have one folder for each color. So now I am at the point where I think I will start combining colours into a folder. A few of my creations on Planet Ink! I have a Galant 3-drawer filing cabinet from Ikea. It fits all my 12x12 papers in it. Are there file folders that fit the 12 by 12 paper too? I am using regular file folders in the cabinet. No need for special ones. Ikea do sell normal ones and they come in various colours but i had some old ones from a stationery company that I'm using. These are roughly 13x14 hanging folders that I use in my rolling cart that's for 12x12 paper, but I dont know how the Galant is set up or if metal hanging folder frames that are inserted into drawers are available. They're quite sturdy and hold a good quantity of paper. Last edited by bjeans; 12-15-2018 at 03:01 AM..
Hi All. My 12x12 papers fit into the Galant with only about a half-inch space above the paper. Therefore, I don't believe that the Galant would house 13x14 folders. The Galant does have metal folder rods in it, and I use regular hanging folders (we call them suspension files here). I use the rolling cart for my 12 x 12 cardstock, I can roll it underneath the countertop and not have to worry about the light fading it. I also like the Storage Studio paper file and use those for my patterned paper. I have several old magazine holders that I use, and Retrospect used to make a 12 x 12 magazine type vertical file. 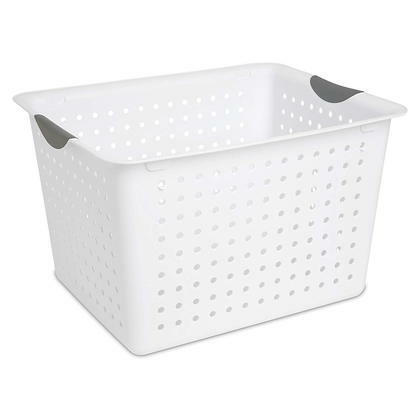 But the last option I got were these Sterlite deep bins at Dollar General. They will hold quite a few of those paper files. So if you just need something that you don't have to lug around, this is a good option. I have two that sit on the floor and work great.